Ridgewood Ranch, Home Of Seabiscuit! $37 PER NIGHT ($33 WITH GOOD SAM OR SENIOR DISCOUNT) FOR UP TO 2 PEOPLE PER RV. $2.00 DAILY FEE PER ADDITIONAL PERSON. FULL HOOKUPS INCLUDED IN PRICE. We Accept Checks or Cash.No Credit Cards At this Time. NOTICE: WE ARE WIRED FOR 30 AMPS, SO THE USE OF ELECTRIC APPLIANCES SHOULD BE LIMITED TO AVOID TRIPPING CIRCUIT BREAKERS. We cannot accommodate 50 amps. behavior or their children at all times. laundry, showers, restrooms, pool or pool area. adult poolside. NO FOOD OR DRINKS IN THE POOL AREA. Pool hours 8:00 am to dark. should accompany children to the restrooms. • No riding Skateboards, Bicycles, Etc. on the hill. • NO FIREWORKS ALLOWED AT ANYTIME! • Please Use Garbage cans for all trash litter. sewer drain.Please do not place any Paper products down the sewers. • Please do not wash your RV in our park. • Park speed limit is 10 mph. Laundry facilities are located in the front Office building. 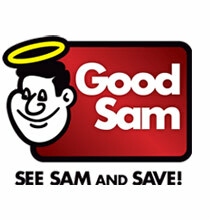 Are you a Good Sam Member/Senior?